Mike Kintner (from left), Harrah’s director of marketing and operations, Jane Stimmel, Harrah’s employee engagement manager and HERO chair, James Sylvester, board member at HOHP, Udo Cook, HOHP co-chair and Robert Livingston, Harrah’s general manager. 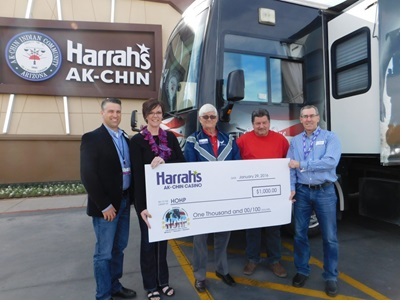 Recently Harrah’s Ak-Chin Casino presented a $1,000 check to Honoring/Hiring/Helping Our Heroes of Pinal County (HOHP). HOHP works to ensure that Veterans and military families in Pinal County have access to services nearby. In addition, the staff at Harrah’s Ak-Chin Casino collected and donated more than 1,000 non-perishable food and other items as part of its ongoing commitment to giving back to the community through its HERO employee volunteer program.